I love my birthday! I woke up to presents from my husband Paul, hung out with Luke, got birthday wishes all day (Facebook is the best! ), and took a beautiful yoga class with my dear teacher Rima. Then, I came home and made this dinner. My husband took this picture and also cleaned up! Then we went to the theater. I am a lucky girl! 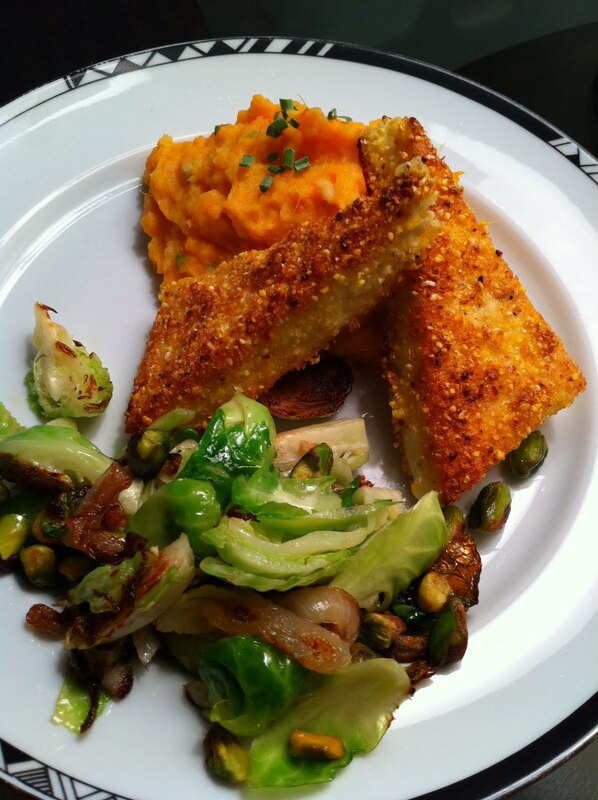 My friend Melissa Christy taught me how to cornmeal crust tofu and make mixed mashed potatoes. Of course, I altered the recipes to fit my taste but I came up with the Brussels sprouts recipe on my own! The key to making this in half an hour is to organize yourself. Take the tofu out of the box, drain it, and place it on a towel lined plate. Cover with another towel and then set something heavy on top of it to press out the excess water. Peel and dice up the potatoes. Place them in a pot and cover with water. Bring to a boil and let them cook until they are fork tender, about 15 minutes. Slice the shallots thinly and halve the Brussels sprouts. (Cut off that little nubby end! The very outer leaves may come off. That is okay. If they look nice toss them in too!) In a skillet, heat up some olive oil and start to carmelize the shallots by cooking them on medium heat. Set up the tofu crusting station. First, slice the tofu block in half horizontally. Then cut each half again and then again into triangles. Pour the rice milk into a bowl and add the cornstarch. Whisk it together. Pour alot of cornmeal onto a plate. Season with garlic powder, salt and pepper. Missy uses chili powder but I did not want it too spicy but any of your favorite spices will do. Dredge each triangle in the rice milk/cornstarch mixture and then the cornmeal. Set aside. Add the Brussels sprouts into the pan with the shallots, add salt, and toss around. Turn up the heat. In another skillet, heat up some high heat oil like safflower. When it is ripply, it is ready to go (you can throw in some cornmeal to test it…if it starts to bubble, it is ready.) Place the tofu triangles in and let them go. Turn the tofu over gently using two spatulas. You want to be careful not to mess with the crust on the sides. Pour the pistachios into the Brussels sprouts and toss around. Everything should be finished at the same time. Plate it up and enjoy!